The Patented Vacuumarator™ is the heart of our system. The Jets Vacuumarator™ pump is the most compact, efficient and reliable vacuum generator available for vacuum toilet systems. 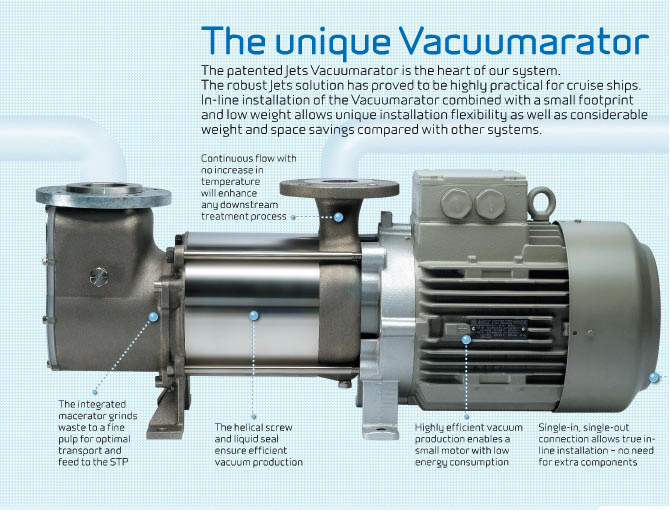 The Vacuumarator™ pump is a liquid ring screw pump with an integrated macerator. Vacuum is generated directly in the pipeline. The sewage is collected, macerated and discharged in one operation. A Vacuumarator™ pump can pump directly to a sewage treatment plant, to a collecting tank of any type, or – in some cases – directly overboard. A Vacuumarator™ pump may also be used as a discharge pump or as a transfer pump.